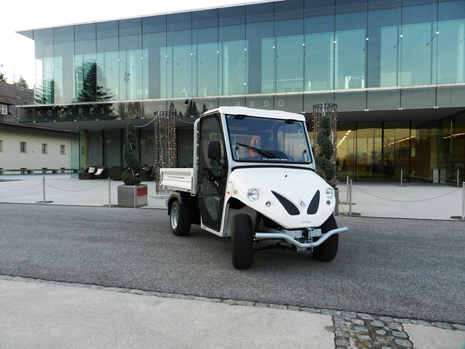 An Alke' electric pickup ATX210E chosen for the general maintenance tasks in the main venue of the Slovenian Government for diplomatic meetings. 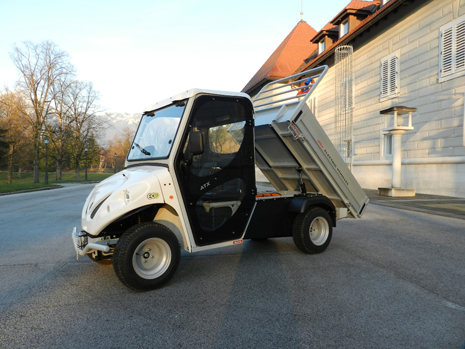 The ATX210E electric pick-up has been purchased to replace a gasoline vehicle and one of the main requirements has been that it was silent. The Brdo estate, covered by 478 hectares of wood, parks, avenues and nurseries is the headquarters of the Slovenian Government for diplomatic meetings and other events sponsored by the government. Here are held summit meetings of statesmen and protocol events. 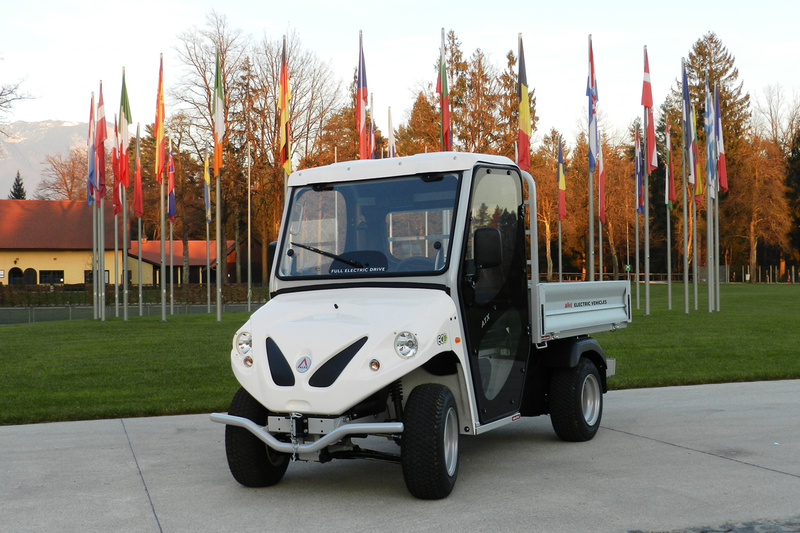 The ATX210E electric pick-up has been purchased to replace a gasoline vehicle. One of the main requirements has been that it was silent, it is in fact used in the large estate where you can find among other numerous animals and must be able to be used for general maintenance tasks inside the park and between buildings without disturbing neither the animals nor the guests. 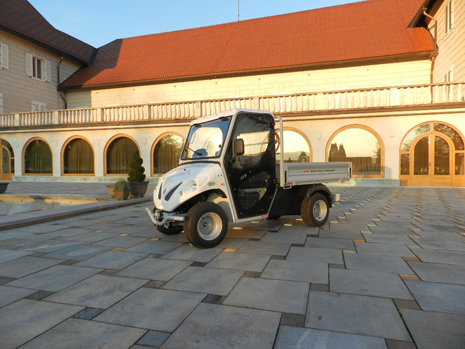 Within this wide estate there are in fact a castle, a hotel, a conference center, and being able to perform ordinary maintenance activities at any time without disturbing is definitely a factor of considerable importance. 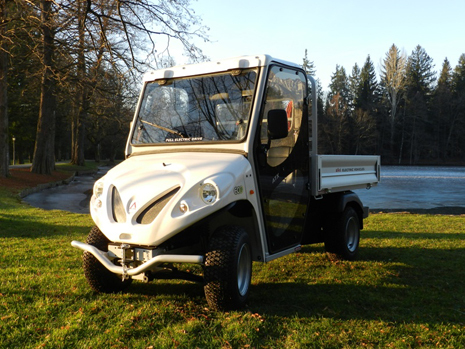 Alkè utility vehicles being electric, besides not being noisy do not even emit CO2 and therefore do not pollute the surrounding environment. In this type of residences, where there are also have diplomatic meetings, to have such vehicles as this is definitely an added value and show respect and care for both the flora and fauna that characterize the environment and the people who make use of the structure. In addition to being silent was required that the pick up had also the cab closed and the heating and Alke ATX thanks to its many accessories has been up to expectations. 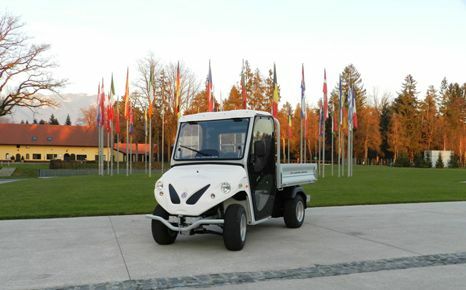 The customer, starting from the basic vehicle has in fact the possibility to customize it according to his needs, you may have to choose between different types of batteries, colors, fittings of the cargo, tires and various other accessories. 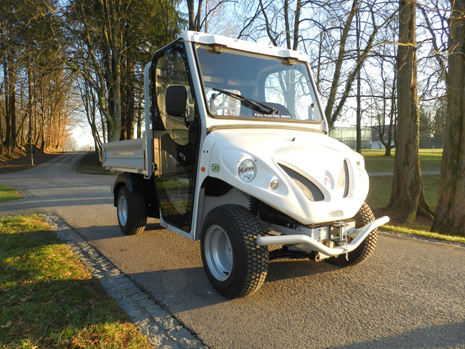 With its 70 km of range the ATX210E electric pick-up is operating for a full working day and it is definitely also suitable for use in large areas such as Brdo. To know all the technical characteristics of the ATX210E model you can see the technical specs sheet. For more information about the Brdo estate in Slovenia: Wikipedia - Brdo Castle. The technical specifications, design and performance of the products listed in this page are indicative and may undergo modifications without forewarning.